Today when I went to yoga, my teacher handed me this. I have been a regular student, 5 days a week (most weeks) since September. I have truly become addicted to this healing form of self awareness. Like I wrote about before in a previous post, the yoga here, at this studio is unique and everyday is catered to your individual needs. Each one of us in class will be positioned in a different pose and the timer set from anywhere from 2-15 minutes depending on the pose and your problems. My teacher has become someone very special to me and between my broken korean, her broken english, stick figures and sign movements, I have taught her body parts in English and she has given me something even more special…self awareness and strength. This letter, translated through people at work says that she wants to make a M-F yoga journal for me so I can practice on my own at home. She says that her teacher has been practicing for 30 years and it is not like yoga from America or India or China or even Korea. It is a mix of Khundalini breathing, stretching, Chakras, and pushing your body to its absolute breaking point…in a good way. She also wrote about when I want to get pregnant, how working with this style will make our kids smart and healthy because their cells will be purified as they develop in my womb. It goes on to say how she is happy I came to her studio and wishes me luck in my future. I have to say once again I was all teared up and wrote her a letter back in English in which a coworker translated into Korean for me. I have 2 1/2 more months to soak up as much knowledge as I can from her. Right now, she is doing a 6 month training in Seoul on the weekends where from 10 pm-6 am they do breathing exercises through the night to strengthen themselves and build up energy from within and brighten their lives. I will miss her greatly: there are two teachers, I call them both sunsangnem and love them both so much) They work together, walking around the room, sitting on us, stretching us, pulling us and healing us. 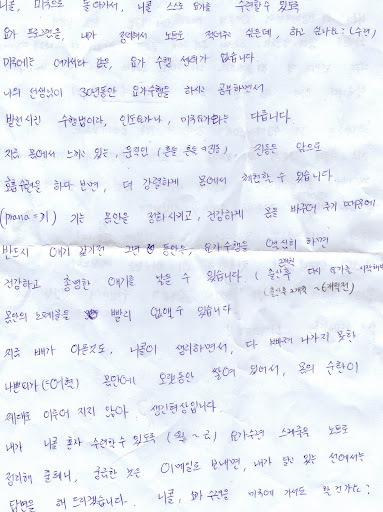 If you can read Korean, you can read my letters first hand and let me know if I missed anything. awesome post, so glad i started going to class with you!